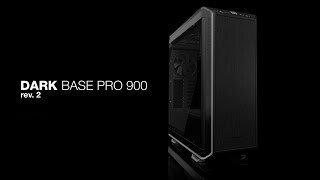 DARK BASE 900 | ORANGE silent high-end PC cases from be quiet! The three pre-installed Silent Wings 3 140mm PWM fans offer virtually inaudible operation. They are equipped with a smooth-running 6-pole motor, durable fluid-dynamic bearing and airflow-optimized fan blade design. The frame has funnel-shaped air inlets that generate high air pressure. The installation options are flexible thanks to repositionable single HDD slots. Supports up to 7 HDDs, 15 SSDs and 2 optical drives. The assembly and handling concept gives you modularity choices, empowering you to create systems that meet the highest of standards. With its smart silence concept, Dark Base 900 Orange is the perfect case for the extreme requirements of overclocked systems and super silent water-cooled PCs. It can carry up to nine additional fans, up to four radiators and has noise-reducing vents all around the case that provide ultra-effective full circuit airflow. The cases side panel is equipped with an adjustable cover that flexibly suits your individual needs. You can close it for absolute silence, partly open it for more air intake, or completely remove it with the possibility to mount up to two additional fans. The front I/O port offers perfect compatibility for your high-end PC. Manual stepless fan controller supports up to three PWM and three 3-pin fans. 2x USB, 2x USB 2.0, HD audio jacks.